Star Wars: The Last Jedi will not only introduce us to a whole host of new Force-tastic characters we’ll no doubt learn to love, but it also sees the return of some of the franchise’s most iconic faces too. One original cast member who won’t be showing up in the next installment of the trilogy though is… well, that would be telling now, wouldn’t it? You’ll have to scroll down to find out who I’m talking about in case you don’t want the surprise spoiled. 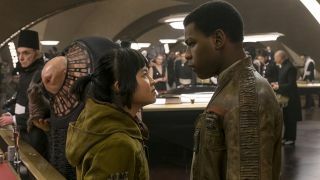 Rian Johnson loves a juicy soundbite or two, but Lando fans will want to cup their ears tight and avert their gaze right about now. When asked by EW if the big betrayer himself would make an appearance, Johnson was unequivocal in his response: “No, and I don’t want fans to get their hopes up, he’s not in the film and it was never really something that came up. I’m… not sure if that’s the best move. On the one hand, it’s nice that the movie isn’t completely leaning on the past, especially as Luke and Leia are bound to take up a big chunk of screen time, but it would’ve been nice to have Billy Dee Williams back for a quick cameo. Having said that, nothing’s been ruled out for Star Wars 9. Keep your fingers (and moustaches) crossed. For something we might see in Star Wars: The Last Jedi, there’s a compelling theory as to how Rey gets her lightsaber, and just in case you missed it, here’s some new images too.